HANOVER, N.H. — Hillary Rodham Clinton said Friday she takes a “backseat to no one” on championing liberal causes, presenting herself as a standard-bearer for Democrats as primary challenger Bernie Sanders generates large, energetic crowds. Clinton addressed 850 people at an outdoor amphitheater at Dartmouth College, a last-minute venue change made to accommodate a larger audience. Days earlier, Sanders spoke before about 10,000 people in Madison, Wisconsin. The former secretary of state made no mention of Sanders but warned that Republicans would unravel President Barack Obama’s policies if they recaptured the White House, including the repeal of his signature health care overhaul. 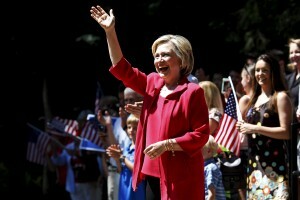 “I take a backseat to no one when you look at my record of standing up and fighting for progressive values,” Clinton said on a sun-dappled kickoff to the Fourth of July weekend in Hanover, New Hampshire, across the Connecticut River from Sanders’ home state of Vermont. The former New York senator’s team has been wary of likening her to the equivalent of Obama’s third term but her acclaim for the president’s policies highlighted a string of recent victories by the White House in its defense of the health care law, the Supreme Court’s ruling allowing gay marriage and steady economic numbers. In a rare discussion of foreign policy, Clinton spoke supportively of Obama’s efforts to reach an agreement with Iran to curb the country’s nuclear program, talks that she helped set in motion as secretary of state. Previewing next week’s deadline for negotiations, Clinton said she hoped the U.S. would “get a deal that puts a lid on Iran’s nuclear weapons program” but said it was “too soon” to know if that was possible. Seeking the Democratic nomination, Clinton’s focus has been on economic issues, the driving force behind Sanders’ recent rise in polls. The senator describes himself as a democratic socialist and has won elections in Vermont as an independent. He has drawn large crowds around the country and reported raising $15 million since late April, about one-third of the $45 million Clinton has brought in. Sanders said on Friday in an email to supporters that he would release a series of policy proposals in the next few weeks “to address the major issues facing our nation.” The campaign is seeking to ramp up its volunteer base and planning to hold organizing meetings across the nation on July 29. Some of the people who came to see Clinton at Dartmouth said Sanders could ultimately have a positive influence on her in the nation’s first primary state. “I think he’s pushing her to address some issues and I think that will be all for the good,” said Sybil Buell, a Norwich, Vermont, resident who attended the Clinton event. Buell said she was “on the fence” over whether to support Clinton or Sanders in the early stages of the campaign. “There’s a little feeling of inevitability with her,” said Chuck Manns, of Lebanon, New Hampshire, who backed Clinton in 2008. He said Sanders was a “curiosity right now,” but predicted Clinton’s electability would shine through.